(CNN) -- Los Angeles Dodgers outfielder Manny Ramirez said a doctor's prescription led to a 50-game suspension for violating Major League Baseball's drug policy, but he won't appeal the punishment. 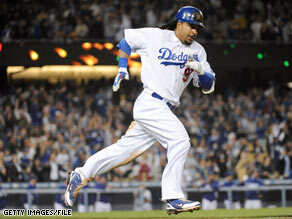 Manny Ramirez hits a home run for a 4-3 lead against the San Diego Padres on April 30 in Los Angeles, California. The 12-time all-star's suspension is effective immediately, Baseball Commissioner Bud Selig's office announced Thursday. A a non-steroid drug prescribed for a "personal health issue" led to a positive drug test, said Ramirez in a statement Thursday released through the Major League Baseball Players Association. But he has waived his right to challenge the suspension. "Under the policy, that mistake is now my responsibility," Ramirez said. He did not disclose the substance or the condition it was prescribed to treat but noted that he had passed 15 previous drug tests in the past five seasons. He said his doctor believed the drug was "OK to give me," but it turned out to be on the league's list of banned substances. Ramirez was the most valuable player in the 2004 World Series and has hit 510 home runs since being called up to the majors in 1993. He has been a marquee player for the Dodgers since they acquired him from the Boston Red Sox in mid-2008, with the team recently designating a section of the left-field stands "Mannywood." In his statement, Ramirez apologized to the Dodgers, manager Joe Torre and the team's owners. "L.A. is a special place to me, and I know everybody is disappointed. So am I," he said. "I'm sorry about this whole situation." Los Angeles is 21-8, the best record in the major leagues and the team's best start in more than 25 years. At the time of the suspension Ramirez had a batting average of .348 with six home runs and 20 runs batted in.